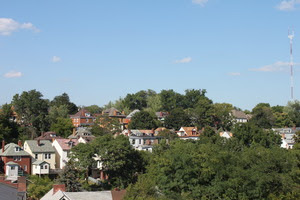 Richard and Kathleen Klick are new homeowners to the Observatory Hill neighborhood, having purchased their home at 151 Oak Park Road in late 2005. They came upon the Acorn Hill area when they attended the Acorn Hill Block party with their daughter, who had recently purchased a home on Marshall Road and fell in love with the area. Current residents of Lebanon PA, they plan to move into Acorn Hill permanently sometime in the next few years. Their home was built in 1923, and you’ll get a unique insight into the home’s history by viewing the original architectural drawings that the Click’s will have on display during the tour. The Click’s Acorn Hill location represents what draws people to Observatory Hill, and their home represents what people love about old homes – tons to enjoy, and lots to keep you busy!